While this chili is absolutely delicious, I’ve since posted my all-time favorite chili recipe. It’s the one I make all fall and winter long, so I invite you to check it out! 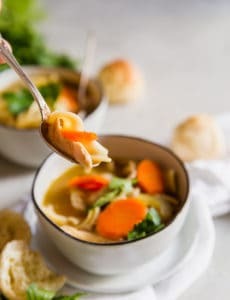 Fall seems to have taken a permanent hold over the last few weeks and as a result, I’ve been craving a warm and hearty comfort meal full of flavor. 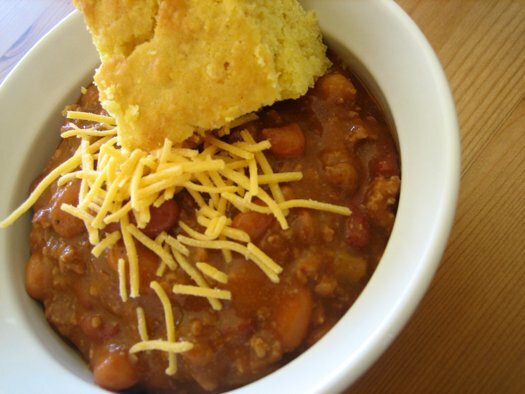 What cures that craving better than a big bowl of chili that has slowly simmered for hours? Not much, right? I have only ever made one other version of chili, which is the one my mom made growing up. While it’s certainly a great meal, it’s not quite authentic – it doesn’t contain much in the way of seasonings and includes rice. So I went off in search of a more traditional chili recipe. The web was full of recipes, so I finally settled on one (I love Wendy’s chili!) and then went ahead and tweaked it to suit my tastes. Since I don’t like very spicy foods, the amount of chili powder and cumin in this recipe probably seem low to the chili aficionados, but it’s just as easy to ramp them up, so adjust them to suit your own personal tastes. The amount that I include in the recipe is enough to taste the seasonings, but not enough to set your mouth tingling. This is one of the best homemade bowls of chili I have ever had. The combination of flavors is fantastic, the beans make it a truly hearty meal, and the absolute key is the long slow simmer that allows all of the flavors to meld together and thicken into a fabulous chili with a smell so enticing that it would wake up the soundest of sleepers. 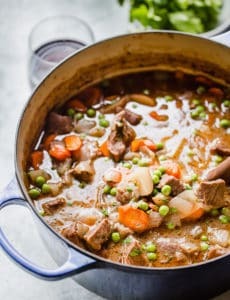 I would suggest the 2-3 hours of uncovered simmer as a minimum – I actually simmered uncovered for 2 hours and then covered the pot and simmered for another 2 hours. It improved substantially in that time. I served chili with the traditional accompaniment – cornbread. I fell in love with this recipe last year and it’s probably the most authentic (save for a cast iron skillet) that I’ve tried yet. Enjoy!! 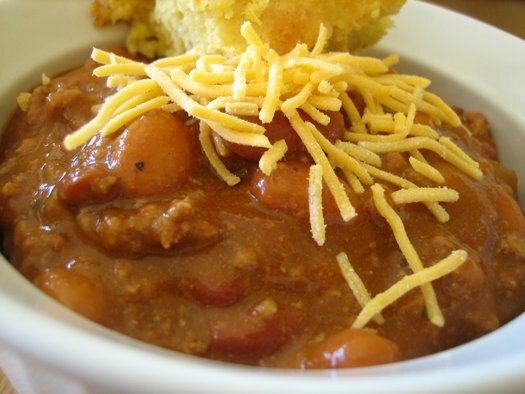 Try this homemade version of Wendy's chili! 1. Brown ground beef in a large pot (I used my 7.25 qt Dutch oven) over medium heat. 2. Drain off the fat. 3. Combine the beef plus all the remaining ingredients, and bring to a simmer over low heat. This is a nice chilly fall day in Singapore. Try this recipe – adjust cumin and chili seasoning to taste. I have never had 2 T of cumin and 3 T of my chili seasoning be too much for anyone. •	2lbs ground beef I use 90% fat free – better for the heart and figure. I also prefer Angus meat because of flavor. •	1(29 ounce) can kidney beans (with liquid) I use dark red kidney beans here, drained and rinsed. Cuts down on gas. •	1⁄2cup diced green chili pepper (, 2 chilies) In my house, I stick with bell peppers, using red and yellow to add a visual effect. If anyone wants it spicier, I have hot sauce – never used. 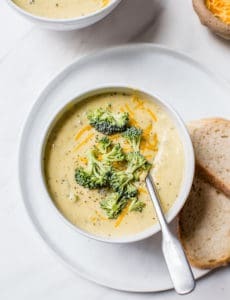 •	3medium tomatoes, chopped I substitute 2 or 3 15 ounce cans of petite diced tomatoes – better flavor and texture than Wendy’s according to everyone who has tried my version. It is where you are adding back the liquid you washed off the beans. •	2cups water I would say 1 or 2 cups water, to taste, closer to the end of cooking. •	1 tablespoon of masa flour, as found in Maseca Tortilla Mix. Stir into the water you add. Gives a beautiful sheen, a “something extra” hint of flavor (corn), and slightly thickens and binds the ingredients with the liquid. 1. Brown the ground beef in a skillet over medium heat. 2. Drain off the fat. 3. In a large pot, combine the beef plus all the remaining ingredients, and bring to a simmer over low heat. Do not add the water or masa flour at this time. Save them for the last 30 minutes of cooking. When you add the salt until you have added the masa flour mixture. Please salt to taste. 4. Cook, stirring every 15 minutes, for 2 to 3 hours. Where is the recipe for Wendy’s chili? I do not want to print it if I do not know what it is in it. Thank you. Hi Joey, The recipe is above, in the recipe box.